Storm Willa is moving inland after it made landfall on Mexico's Pacific coast. Willa has rapidly weakened but torrential rains are falling over west-central Mexico. The US National Hurricane Center has warned of potentially life-threatening flash flooding and landslides. It also warned of large waves and rough surf conditions on the coast of the states of Sinaloa and Nayarit and of continued strong winds. Willa was a category three hurricane when it made landfall but has since weakened and been downgraded to a tropical storm. 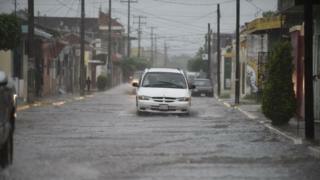 It hit land just 15km from the town of Escuinapa in Sinaloa state, where it damaged the roof of the local hospital. Residents of the town who had gathered at a shelter told AFP news agency they were concerned about their homes and possessions. "You feel bad leaving everything behind, but what can you do? We're up against nature," a local farmer said. Earlier this month, areas of the US were devastated by Hurricane Michael, which left at least 27 people dead. Michael, which made landfall on 10 October, was the most powerful storm ever to hit north-west Florida. Residents of Mexico Beach, one of the areas worst affected, described the aftermath as a "war zone".